Taylored Expression December New Release! There are eleven new stamp sets, nineteen new dies and two new embossing folders released today. Today I am sharing with you my project using Quick Critters stamp and die set. 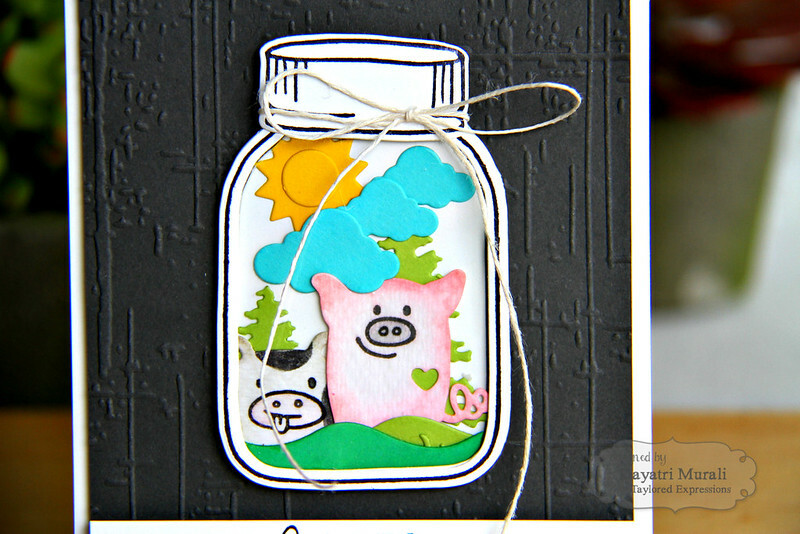 I have combined the Quick Critters stamp and die set with Mason Jar stamp and die. This is my card using the above mentioned stamp and dies along with few more Taylored Expressions products. I wanted to create a scene for couple of quick critters. I decided to use the Mason Jar to frame the scene. To make the scene I die cut the Rolling Hills using Granny Smith cardstock, Sponged one of them before adhering on the inside piece of the Mason Jar die cut. This shades of green give depth. Then I die cut some trees using Evergreens dies and clouds and sun using Little Bits Clouds and Sun die. Using these die cuts, I created a landscape scene. Then I die cut one piggy and one cow using Quick Critter die, stamped their faces using the coordinating stamp set, then coloured the die cuts in pink for the piggy and black patches for the cow. I added them to the scene. Trimmed off the excess. I then layered the inside of the jar with its stamped and die cut outline suing foam adhesives. I then tied a string with a bow around the neck of the bottle. Here is a closeup. The background is embossed using Weathered embossing folder on Oreo cardstock. I adhered this on the cardbase. The sentiment is fromQuick Critters stamp set which I simply stamped on a strip of white card stock and added below the Mason Jar. I love how this card turned out. Hope you like it too. What a great card!! Awesome background, and I love all the adorable images in the jar!! Man, I just love ALL their products! How clever to create the little scene in the jar…this is just tooo cute!!! !